3D animation is playing a key role in the content marketing of businesses and brands. It is helping them to visualise ideas, products and processes in ways impossible in real life or using other forms of animation. If you haven’t heard of the audiobook powerhouse Audible, they provide a massive library of audiobooks, have radio and TV programmes and audio versions of newspapers and magazines. They worked with a 3D animation company to produce a video ad which demonstrated the types of people who use Audible, and how it fits into their daily lives. The video presents several book genres in a visual way. As audiobooks don’t physically exist, the 3D animation design was used to illustrate the different types of books. The integration of 3D with the tagline, ‘I am what I read’, creates a representation of how audiobooks integrate easily into your daily life and can be enjoyed in a variety of real-life scenarios, such as whilst driving. In this particular ad, they use the actor’s faces as a platform for the 3D animation and then work around that. When the child explains that she listens to audio-books about princesses while she tidies her room, the mess of toys and pencils in her room forms around her headphones to create a princess crown of her own. Representing non-physical products by working with 3D animation design can bring your intangible product into reality. Audible made the sound of their audiobooks physical by working with 3D animation. Borgata is an online casino app who provide a variety of traditional casino games which can be accessed from mobile devices. They worked with a 3D animation studio in order to create an advert for their app. Animated movie companies have the power to bring something which only exists in an online form into the real world. This video replicates the excitement of being in a physical casino despite the casino being online. By creating the video in 3D the various casino items, such as playing cards and Poker chips, can move in a way which they wouldn’t normally. As a result, the video could be more accurately timed to the music featured in the ad. Toggl provide a time tracking app for agencies, teams and small businesses. 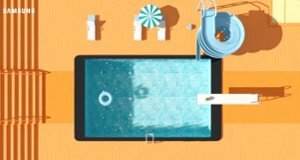 They worked with a 3D animation company to create a video which represented the different ways their services could be used. By using 3D animation design, Toggl could represent the types of tasks that can be timed as fun characters. By doing this, they could avoid just filming product demonstrations to get the point of their app across. At Skeleton, we think slightly more mundane tasks such as doing calculations, making spreadsheets and replying to emails are way more exciting as cute little characters, wouldn’t you agree? Varilux design varifocal lenses and are the company who invented the first varifocal lenses. These lenses are then distributed to opticians all over the world. They created a brand video in order to reaffirm themselves in the vision science sphere. They did this by showing the history of their scientific discoveries and brand, utilising a 3D animation company to help their video stand out from competitors. 3D animation was used with live action to represent time travel through the brand’s history, to show their presence around the world, and to add depth to their scientific process. Specific scientific details, such as the work that goes into design and patents, were shown in a 3D space in order to demonstrate the sheer volume and present them to the audience in a tangible way. In addition to this, animated movie companies can allow the viewer to see parts of the science behind a brand which can’t normally be seen by the naked eye. Samsung, one of the worlds top manufacturers of electronics, are well known for their smartphones and mobile devices. They produced a 3D animated video for the release of their new Tab A tablet. By working in 3D, Samsung could show the tablet in a variety of environments to demonstrate key features about it, such as animating it to be the size of a billboard to represent the screen size, and on a racetrack to show the speed. Without creating giant versions of their tablet, Samsung would not have been able to achieve these feats without working with a 3D animation company. Europa provides logistics services, utilising air, road and sea. They used 3D animation design to demonstrate how effective their service is. Using 3D offered a comparison between a disorganised logistics company and Europa’s organisation, without having to film another company being sub-par in Europa’s eyes. This enabled the 3D animation studio to have complete control over how they would portray an alternative to Europa, as well as being able to demonstrate how Europa’s internal infrastructure works with ease. As you can see, 3D animation can be an excellent way to demonstrate ideas, products or services in a unique and exciting way. 3D animation studios have a great understanding of how to make your vision a reality. Biz Tips: How Are In-App Gestures Shaping User Experience?